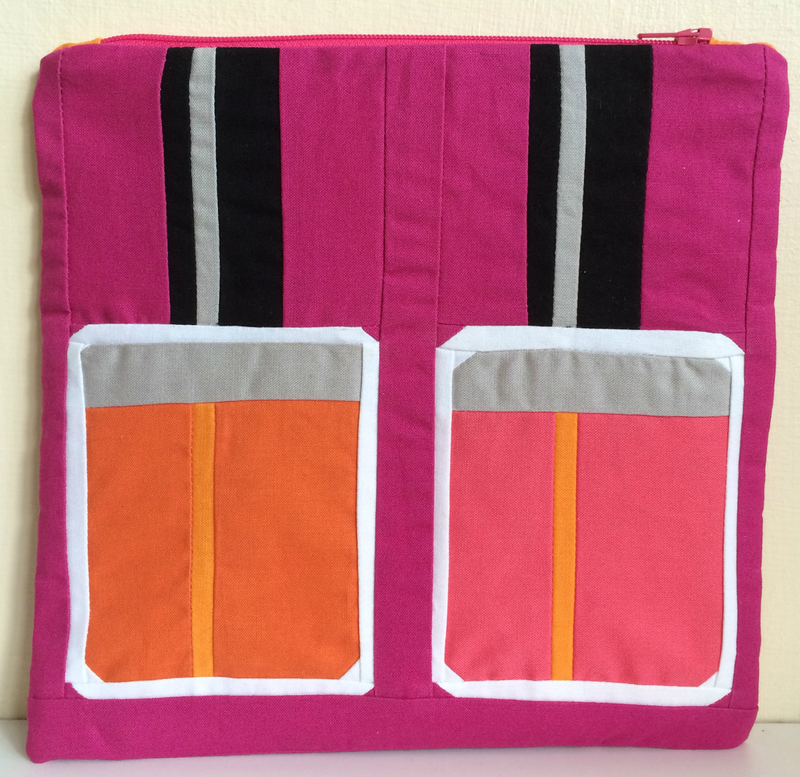 Recently the Fat Quarter Shop asked me to if I would like to make their latest free pattern from It's Sew Emma, the Nail Polish Quilt Pattern. I used to manage a make up counter (yes I also used to be a University lecturer but guess which job I enjoyed more?) and I still love playing with make up so I jumped at the chance. I decided not to make a quilt because I literally had bottles of nail polish dotted all around my house and thought this would be the perfect pattern to create a bag to keep them all in. I swear I found bottles of polish hiding in every room, no wonder I can never find the colour I want! To make the bag I had to adapt the pattern slightly, I basically just cut the measurements in half so it wasn't too tricky. The only adjustment was the outer borders but that was probably due to my seam allowance. I chose my favourite colours and realised I have a lot of polish in pink and orange. I tend to use the gorgeous Rimmel Instyle Coral the most. I can't be sure of the exact colours of Kona I used, I must get better at labelling my fabric, but I suspect they are School Bus, Orange and maybe Melon and Bright Pink. I seriously need to get some colour cards for solids! Inside the bag I used this Littlest print, which has fast become one of my favourite low volume fabrics. You can find the free Nail Polish pattern here and also check out this great video so you can quilt along! I subscribe to the Fat Quarter Shop YouTube channel and I recommend you do the same, it's packed with great tips, interviews and other fun stuff! This is another check off my fal list (it's #7 the secret orangey one Katy!). Superb, love to see a spin on a pattern, yours is pretty smart! Such a fun bag! You can paint my nails anyway! what a great way to use this pattern - so fun! Very cute!! I am planning on eventually making a sew together bag for my make-up - I don't have tons (I don't have nails for nail varnishing) but it will be nice for our wedding holiday. What a perfect way to use this design! And such pretty polish too! Great idea! I hadn't realised this was a free pattern. This is fantastic news because I fell in love with it at first sight! wonder what age it is we get to that we start buying hundereds of shades of the same colour..... lol and omg! you were a uni lecturer? in what? Great use for the pattern. Fun colors. Love how you used this cool pattern! I will be making one of these for my daughter in her favourite nail polish colours. Love it and is perfect for your pouch!! Super fun pattern! I love the colors you chose. What a great interpretation of the pattern. Speaking of Christmas, wouldn't this make a great gift for a teenage girl? Tuck a couple of polishes tucked inside and cross off one extremely-hard-to-buy-for recipient off Santa's list. Well there you go. I didn't know either of those two careers were in your past. What did you lecture at uni? Does that mean you're a masters or PHD, or something else really smart? !